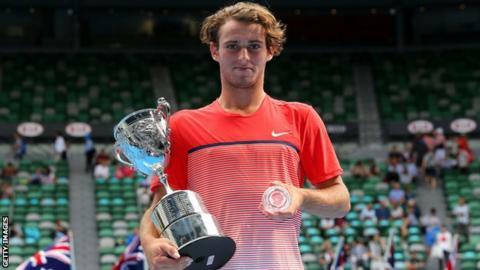 Australian Open junior champion Oliver Anderson has been charged with match-fixing in his native Australia. The charges relate to a match at the Traralgon Challenger tournament in Victoria last October, according to a statement from Victoria Police. Anderson, 18, beat Uzbekistan's Jurabek Karimov to claim the Australian Open boys' singles title in January 2016. "Oliver is cooperating fully with authorities. He now awaits the legal process," said a family spokesman. He will appear before magistrates on 2 March. Anderson, who is from Brisbane and ranked 743rd in the world, was first named by the Age newspaper in Melbourne on Thursday. A Victoria Police statement added: "Sporting Integrity Intelligence Unit detectives and bookmakers assisted with the investigation. "The Queensland man was charged with engaging in conduct that corrupts a betting outcome." In the match at the centre of the allegations, Anderson lost the first set against Harrison Lombe after being broken at 4-4 before going on to win the next two sets. Anderson then lost to John-Patrick Smith in the second round of the second-tier event in Latrobe City. Last year, a joint BBC/Buzzfeed investigation alleged that the Tennis Integrity Unit, the organisation responsible for policing the sport, failed to act on suspicions that 16 top-50 ranked players have been involved in match-fixing. World number one Sir Andy Murray was asked about the issue of match fixing following his straight sets win over Nicolas Almagro in the Qatar Open quarter-finals. "It's disappointing for the game any time something like that comes out," said the Briton. "However, if people are caught and charged, I see that as being a positive thing. "If it's going on and nothing is happening about it that's much worse for the future of the sport. So, if it's happening, there should be the most severe punishments for whoever is involved in it." The tennis authorities robustly defended their anti-corruption record when the BBC and Buzzfeed published their allegations on the first morning of last year's Australian Open. The independent review panel which was established in its wake is due to issue an interim report in the next few months, but there have already been a number of changes made to the Tennis Integrity Unit. Its staff has been doubled in size; it now publishes the number of match alerts it receives from betting organisations on a three-monthly basis; and on the education front, there is an app presented in six different languages for players to download. Read more on The Tennis Files: Have top players been paid to lose?